Sailing an emotional ship to wreck. 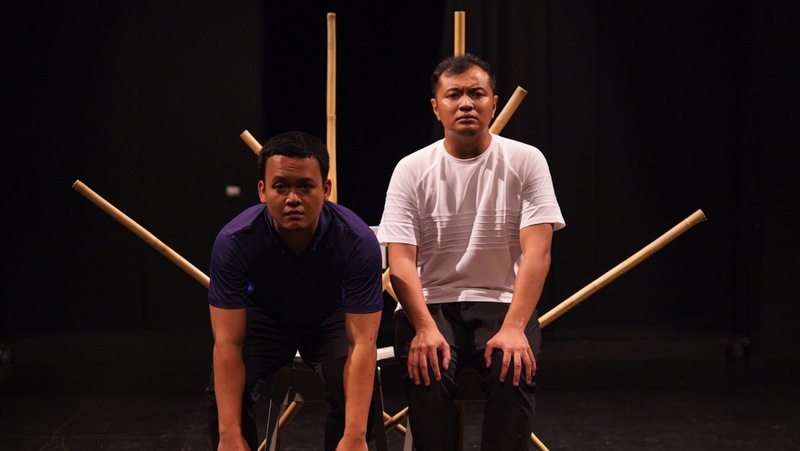 Directed by Soultari Amin Farid, choreographed by Norhaizad Adam and with a script by Nabilah Said, yesterday it rained salt is perhaps the most salient culmination of Bhumi Collective’s ethos yet, combining text, dance and performance to create a work rooted in themes of identity. 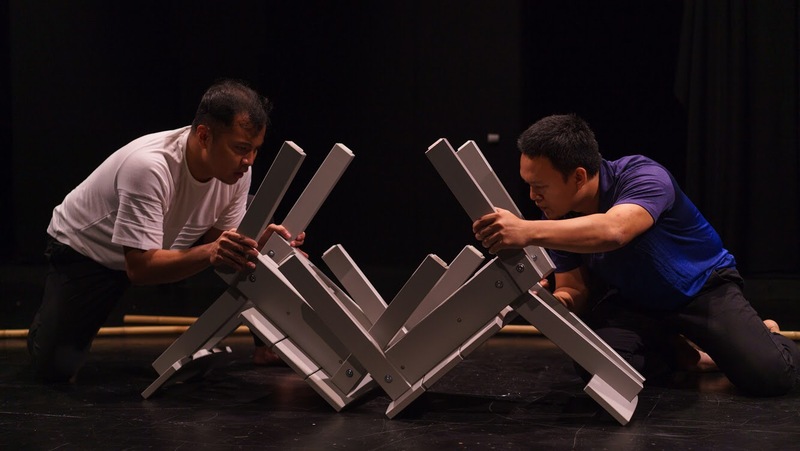 Primarily a movement piece, yesterday it rained salt is an ethereal performance loosely telling the story of Azman (played by Amin) as he returns home from England, encountering his father (Kaykay Nizam) and coming to terms with his own relationship with his family and identity. 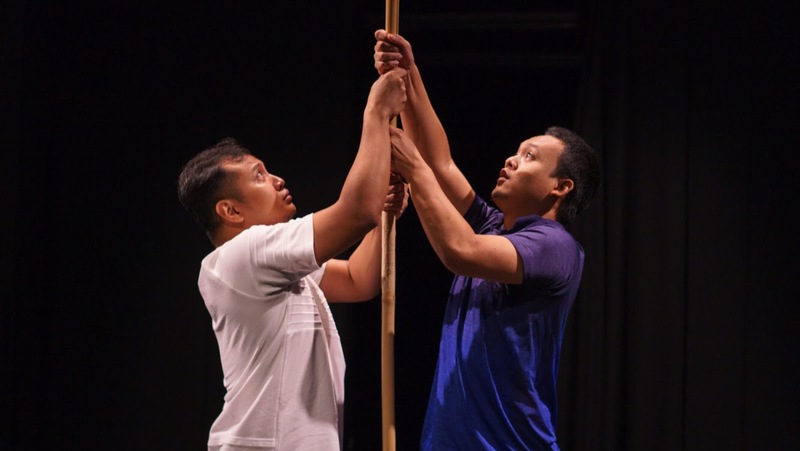 yesterday it rained salt’s magic realist form is an effective one, with Azman finding himself stuck on a boat at sea, his father slowly rowing them home. One interprets this situation as a manifestation of Azman’s consciousness, his fears and guilt of having abandoned his home, missing not one but two family funerals. 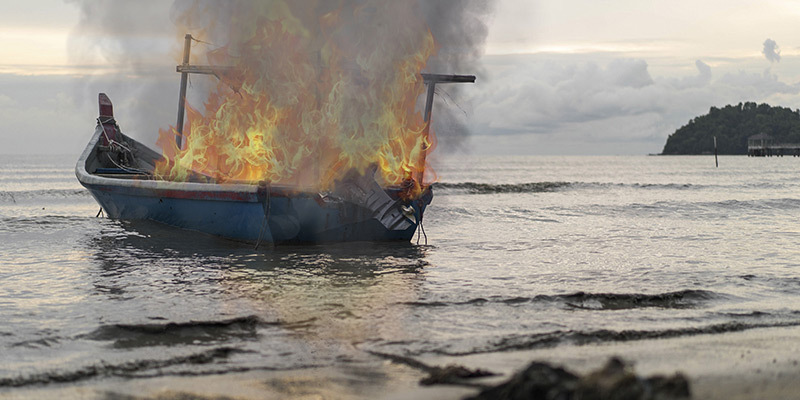 The concept of memory is key to the show achieving its emotional edge, with Azman finding means of healing the fraught relationship with his father through childhood memories and even family history, with his ancestors’ origins as island fishermen with keen connections to the waters. 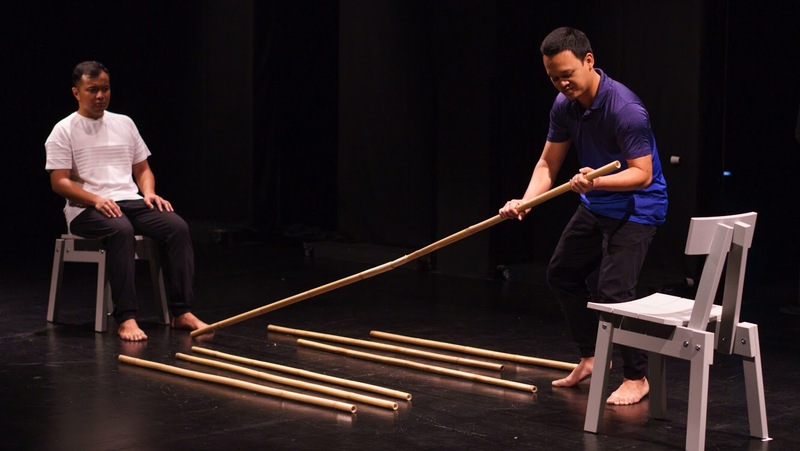 yesterday it rained salt is strongest when it leaves Amin and Kaykay to perform interpretive choreographies that establish and build on their characters’ father-son relationship, effectively using the bamboo poles as violent weapons to bring out echoes of physical abuse, while at others, these poles become a source for bonding as they build and steer the ship together, showcasing the fine line between familial love and loathe. There are moments Nabilah’s script offers narrative clarity, such as a scene where Azman and his father play a word game, as they attempt to translate food items into Malay and English respectively, resulting in an eventual dispute over the proper term for fried bananas (is it ‘goreng pisang’ or ‘pisang goreng’?) that establishes how distant the two have become. However, for much of the script, less is more, and the lengthy lines coming from both Amin and Kaykay’s mouths often come across as jarring, breaking the atmospheric mood conjured by their otherwise beautiful movements. The foundations for a particularly strong movement work have already been laid down – what comes next for Bhumi Collective is a matter of heightening these ideas further still and alchemizing these snippets into a more focused work that moves from exploratory mood piece to knowing exactly what it wants to say with greater force. There is potential for yesterday it rained salt to go beyond issues of the familial and individual and become something epic, with the hint of sprawling, nationalistic themes such as post-colonial sentiment and the concept of progress erasing our ties to the past that could be evoked from such a show. But for now, one can find strange comfort in the stark imagery and surprisingly emotional lilts that Bhumi Collective has created for this work-in-progress, and hope that this ship eventually finds the wind in its sails to truly soar. yesterday it rained salt played on 19th January 2019 at the Esplanade Annexe Studio.